A hard water filter and water softener combination can help reduce many problems associated with hard water. The “hardness” of water comes from high levels of dissolved minerals found in either municipal water or well water. 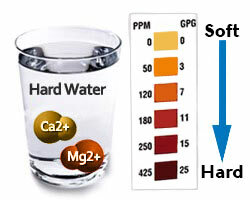 High calcium content is the main culprit for water hardness. When water evaporates, it leaves mineral deposits on the surface of dishes, glassware, sinks, tubs, and faucets. In addition, hard water can cause scale buildup in plumbing pipes and decrease the life span of the plumbing system. Hard water can also reduce the life span of dishwashers, hot water heaters, washing machines, and many other appliances. Is Hard Water Healthy to Drink? I have found that many people believe that hard water is unsafe or unhealthy to drink. However, even though hard water can be devastating to plumbing and appliances, it is usually not unhealthy to drink. However, in some cases where source water has a very high calcium content, it would not be advisable for some people with certain health conditions to consume that water on a regular basis without some type of filtration or water conditioning. Since the hard water issue mainly adversely affects the plumbing, it is necessary to get a whole house water filtration or water softener to reduce the hardness. Reverse osmosis whole house systems are effective at reducing the hardness of water into your home. However, most reverse osmosis systems remove up to 98 percent of all minerals—unless the system also includes a remineralization cartridge which some water filter companies are now offering. Drinking demineralized water long-term is not the healthiest water to drink, in my opinion. You can read more here about the potential health risks associated with drinking demineralized water. In addition, demineralized water is acidic and is thus hard on plumbing and fixtures. The reverse osmosis process also wastes water, since a large amount of the water with minerals and contaminants goes down the drain. Another option, which we believe is a better choice, is a multi-stage whole house water filter system that includes a salt-free water softener. Water softeners and conditioners do not filter out water contaminants. They only reduce minerals. Thus, if you want softer water in your home that is also free of organic and inorganic contaminants, you will need a combination whole house water filter and salt-free water softener system. Salt-free water softeners are actually water conditioners that do not use any chemicals, salt or potassium, and the water produced when combined with a multi-stage water filter is healthy to drink. However, if your water hardness is extreme (above 75 grains per gallon), you may need to get a salt-based water softener to prevent scale buildup. Mu Shik Jhon; The Water Puzzle and the Hexagonal Key; 2004.